by Farley Mowat, 1973, 510 pages. Recently I reviewed The Terror by Dan Simmons, his somewhat fantastical account of the fate of the Franklin Expedition. What I loved about that book was how Simmons put you right there on the ice with the sailors, making it feel like you were one of them. In The Terror, Simmons made reference to several other expeditions and, as I had developed a taste for literary blubber, I found myself wanting to read about those as well. As it happened, I was browsing in that most excellent used book store, The Book Trader in Brockville, Ontario, and discovered an entire section on Farley Mowat (author of Never Cry Wolf, Lost in the Barrens, The Curse of the Viking Grave, and The Snow Walker - all of which have been made into films - and many more besides), and right there in the middle was a nice paperback edition of Ordeal By Ice: A History of the Search for the Northwest Passage. So naturally I snapped it up - and a few others as well! Ordeal by Ice is the first book in a trilogy about the exploration of the polar region. The other books - A Polar Passion and Tundra, deal with the quest to reach the north pole and overland journeys through the Canadian north, respectively. The meat of all of these books are the first-hand accounts of the people who made those trips and lived to write about their experiences. Mowat has read through these accounts, selected the most interesting sections from the best of them, and presented them here in one volume. He binds them together with forewords and afterwords in his own (always opinionated) voice, giving context, filling in the blanks, and summarizing the expeditions he didn't include. I've read a few books by Mowat before (Never Cry Wolf and The Farfarers) and find him to be a lively and engaging writer - and when he makes an appearance in this book, this certainly remains true. The first chapter is all Farley, and he provides a summary of the early history of arctic sea passage from Pythaeas the Greek c. 325 BC to Robert Thorne in 1527. Between these two we hear about Brendan, Eric the Red, Bjarni Herjolfsson, Thorfinn Karlsefni, Arrow-Odd and his son Vignor, Several Ragnors, Paul Knutsson, Pining and Pothorst, Johannes Scolvus, John and Sebastian Cabot, and many more. I had always know that the Norse came to the Americas long before Columbus, but never realized that there had been so many named explorers (and colonists) in the time before Columbus. The next chapters each follow early explorers with first-hand written accounts. The first deals with the voyages of the Elizabethan, Martin Frobisher, in 1576, 77, and 78. The last of these three expeditions consisted of a fleet of 15 vessels filled with miners and equipment to extract what turned out to be fool's gold. Many did not survive the voyage. Next up, Mowat tells us briefly about the the voyages of John Davis and the early travels of Henry Hudson. This is followed by a first-hand account of Hudson's fateful third voyage - the one where he discovered Hudson Straight and Hudson Bay. It is told to us by the curiously named Abacuk Prickett, a defrocked priest who "lived to come home". This story is remarkable because the tyrannical Hudson found himself the victim of a mutiny and was cast out of his ship in a small boat in the middle of the ice-filled Hudson Bay, and was never heard from again. Some of his ex-crew survived to return to England, however, and after a trial seem to have been vindicated. It's a wonder Hudson got such naming credits. The first two accounts are probably the driest of the book - they are also the shortest. After some discussion about the search for Hudson and the fates of some of his mutineers, Mowat introduces us to the Danish explorer** Jens Munk,** who entered the arctic in 1619 with two ships, the majestically named Unicorn and the less majestic Lamprey. He got bunged up in the ice and had to pass a dreadful winter in Hudson Bay, where he watched 61 of his 64 crewmen die, one by one, to cold and scurvy. Munk managed to limp home in the Lamprey, however, and eventually became admiral of the Danish fleet during the 30-years war. "In the evening, the Master of our ship, after [the] burial [of William Cole], returning aboard ship and looking about her, discovered some part of our gunner under the gunroom ports. This man we had committed to the sea at a good distance from the ship, and in deep water, near six months before. The 19th [of May, 1632] in the morning, I sent men to dig him out. He was fast in the ice, his head downwards and his heel upward (for he had but one leg) and the plaster was yet at his wound. In the afternoon they had him digged him clear out, and he was as free from noisomeness as when he was first committed to the sea. This alteration had the ice and water and time only wrought on him: That his flesh would slip up and down upon his bones like a glove on a man's hand. In the evening, we buried him by the others." Next up are a series of short chapters giving us a brief account of the** French attempt to oust the Hudson's Bay company** from the north (including a sea battle in the ice and a siege of a fur-trading fort), a very brief account of the 1719 expedition of James Knight (this chapter is titled "The Marble Tomb" so you can guess what happened), and a chapter summarizing the activities of the forgotten explorers who really became the masters of the north: the whalers. "Of all the voyagers who dared the north-western waters, none came to know the ice so well, none engage it more stubbornly, and none suffered so heavily from it as the whaling men." Mowat tells us. More than 500 whaling ships are known to have been lost in those waters, with probably more unnacounted. 34 ships were lost in just two winters alone in Melville Bay off Greenland due to ice. Yet there are very few accounts, as they didn't publish logs. Mowat includes one here, by William Scoresby 1816. "Under sail! We scarcely knew how we felt, or whether we quite believed it. He must be a seaman, to feel that the vessel which bounds beneath him, which listens to and obeys the smallest movement of his hand, which seems to move but under his will, is a thing of life, a mind conforming to his wishes. But what seaman could feel this as we did, when this creature which used to carry us buoyantly over the ocean, had been during an entire year immovable as the ice and rocks around it, helpless, disobedient, dead." "Never was seen a more miserable-looking people than our party. No beggar that wanders in Ireland could have outdone us in exciting the repugnance of those who have not known what poverty can be. Unshaven since I know not when, dirty, dressed in the rags of the wild beasts instead of the tatters of civilization, and starved to the very bones, our gaunt and brim looks, when contrasted with those of the well-dressed and well-fed men around us, made us all feel, I believe for the first time, what we really were, as well as what we seemed to others." "The swell had become dangerously high, the waves risen ten feet above the trough of the sea. The shocks of the ice against the ship were alarmingly heavy; it became necessary to steer exactly head-on to the swell. We slowly passed a small iceberg 60 or 70 feet high; the swell forced it crashing through the pack, leaving a small water space in its wake, sufficient to allow the seas to break against the cliffs and throw the spray in heavy showers quite over its summit." At the end of this chapter, Mowat summarizes what is known or surmised about the Franklin expedition from various sources, and it's a sad story of death by starvation, scurvy, tuberculosis, and lead poisoning. "in the spring of 1854, Belcher quite incomprehensibly ordered the abandonment of all four of his search ships, recalled all their people to Beechey Island, loaded them aboard some transports there, and sailed hurredly for England. It was an ironic comment on this panic stricken flight that, some sixteen months after she was abandoned, Belcher's flagstip, the old Resolute, piloted herself out of the ice, made her way quite without human aid more than a thousand miles to Cape dyer in Davis Straight, and there fell in with an American whaling vessel. When the whalers recovered from the shock of meeting her, they put a crew aboard, and in due course she sailed majestically back across the Western Sea to England, where her arrival must have had an interesting effect on Belcher." Next up is a part of the account of the remarkable Charles Hall, an American adventurer who self-funded his own way into the arctic in 1860, determined to find out more about Franklin. Hall went in a small boat and, by himself, hooked up with the Inuit and traveled with them, living like them, until he found the remains of the Franklin expedition and put the last few pieces into place. Mowat gives us a part of Hall's journal that deals with a time he was with the Eskimos and how they dealt with starvation. "About half an hour after we landed, my shipmate died of starvation. The evening he died, Samuel Fisher proposed to eat him; he took his knife and cut a piece off the thigh, and held it over the fire until it was cooked. Then, next morning, each one followed his example; after that the meat was taken off the bones, and each man took a share." "We stopped here three days. We then made a start; but the wind being ahead, we were obliged to put back. Here we stopped two more days. During that time, the bones were broken up small and boiled in a pot or kettle we had; also the skull was broken open, the brains taken out, and cooked." They tried to leave again, but got a hole stoved into their boat and had to put back again. "Being unable to haul her up, we were obliged to remain here eight days; it was on this island they tried to murder me." Mowat praises Hall at then end of this chapter, saying Hall and his works have been publicly ignored by most subsequent Arctic explorers (many of whom made their reputations by applying his methods) and by most arctic historians. These grave professionals seem to have resented him because he was, first of all, an incurable romantic, and, secondly, because he accomplished so much by such unorthodox methods. Yet he was as great a figure as any who have faced the ice, before his time or after. He is almost forgotten now by his own country, but he is still remembered by the Eskimo or Bafin Island and of Boothia, who still tell tales, passed on from generation to generation, of the white man who became one of them, and who was a man amongst them. The last narrative chapters belongs to Roald Amundsen, who was the first to transit the Northwest Passage from 1902 to 1905. This account is a little drier than the rest, but feels like a conclusion. The last chapter of the book discussed travels in the arctic from then up to the time of publishing, including war-time and cold war activities. If you've made it this far in this review, it should be obvious that I thoroughly enjoyed this book, and thought it was a great compliment to The Terror. I think some of you ( @clash_bowley ) would enjoy it as much as I did, but if you don't have a stomach for this much history, consider this entry in the collection to be the coles-notes version. :-). 5 our of 5 rating. Sounds excellent! Right up my alley! 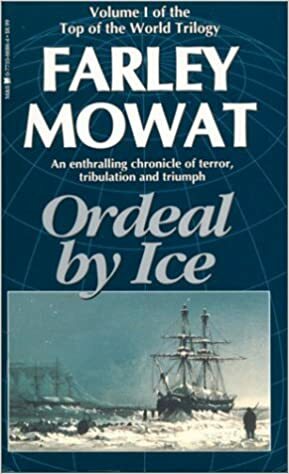 I haven't read Mowat since I was a kid, he was required reading in Canadian schools. Never Cry Wolf has a very memorable set piece at the end of the novel.